I had the pleasure of attending my second class with James Beard Award winning author, teacher, and editor, Molly Stevens last night at the Western Reserve School of Cooking in Hudson, Ohio. Molly's signature book All About Braising: The Art of Uncomplicated Cooking , is one of my favorite books. (Her Osso Bucco recipe is divine). I took a class with her a few years ago, and she made the fluffiest, most delicious mashed potatoes I'd ever had using a Norpro Potato Ricer . It was a revelation! I grew up on 'whipped potatoes' - my mother used the mixer, which definitely produces a heavier potato. Not that I disliked mom's, but the ricer produces a totally different dish. Molly is the co-author of One Potato, Two Potato , which has about every way to cook a potato you can imagine. Up until then, I had no use for a ricer. Now I use it to squeeze the water out of frozen spinach, and I've used it as a mini strainer. I have the stainless steel model and this Kuhn Rikon Potato Ricer with 2 Stainless Disks, White , which I like because it has two different sized disks, with the extra storing on top under a lid. The theme of last night's class was fall entertaining, and started with a simple yogurt cheese, and a homemade rosemary cracker. Both recipes were delicious and easily replicated by cooks of any skill level. 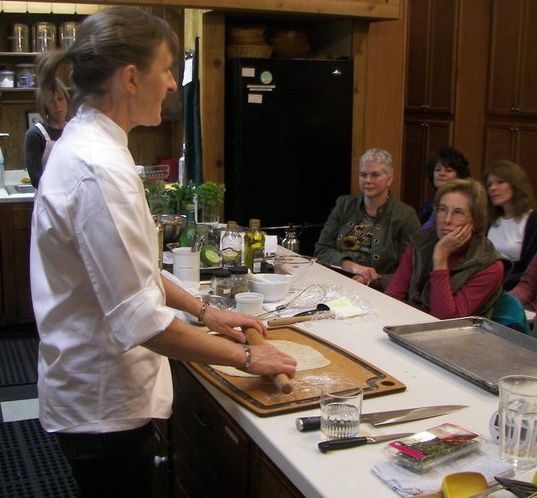 As she demonstrated how to make the recipes, she fielded questions from the audience. One of things I like best about her as a teacher is in addition to her obvious knowledge of techniques and ingredients, she is able to effortlessly answer questions and distill the answer in a way that isn't too technical nor condescending. The next recipe was a delicious two step Roasted Cauliflower Soup with Indian Spices and Chive Oil. (photo courtesy of Catherine St. John). Roasting the cauliflower, and toasting whole spices, added a delicious depth of flavor, and the fresh chive oil provided not only a pretty, but tasty garnish. Next up was a Lime Spiked Roasted Sweet Potato Puree with Brussels Sprouts "Chips" served with a Pan Roasted Grouper. This dish has everything going for it - restaurant style presentation potential, perfect combination of eye pleasing color contrasts, textural interest, and the lime vinaigrette really tames the sometimes cloying sweetness of sweet potatoes and provides just the right pop of acidity. Plus, it's really a pretty easy recipe. I will definitely make it at some point. 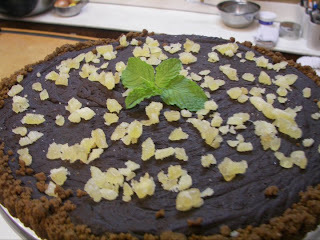 Finally, dessert was one of my favorite combos - Dark Chocolate Tart with Gingersnap Crust. There was a hint of black pepper and the crystallized ginger garnish gives it a little punch on the finish. Delicious! 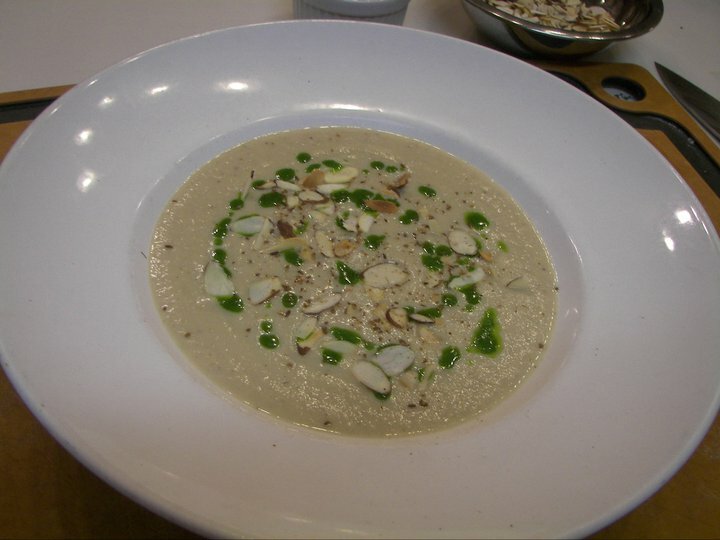 If you are a Fine Cooking magazine fan, you have no doubt seen many of Molly's recipes. She also edited The Best American Recipe series, and the final compilation book, The 150 Best American Recipes: Indispensable Dishes from Legendary Chefs and Undiscovered Cooks (150 Best Recipes) . I have checked out the 150 Best American Recipes many times from the library and I have no idea why I never just bought a copy. (If you've seen the November issue of Akron Life and Leisure magazine you know I have a bit of problem when it comes to cookbooks.) The Turkey Sloppy Joe recipe is one of my all time favorites. So I took advantage of my 10% off class discount and bought copy which Molly signed. She is teaching another Italian themed class tonight - there were still spots available. 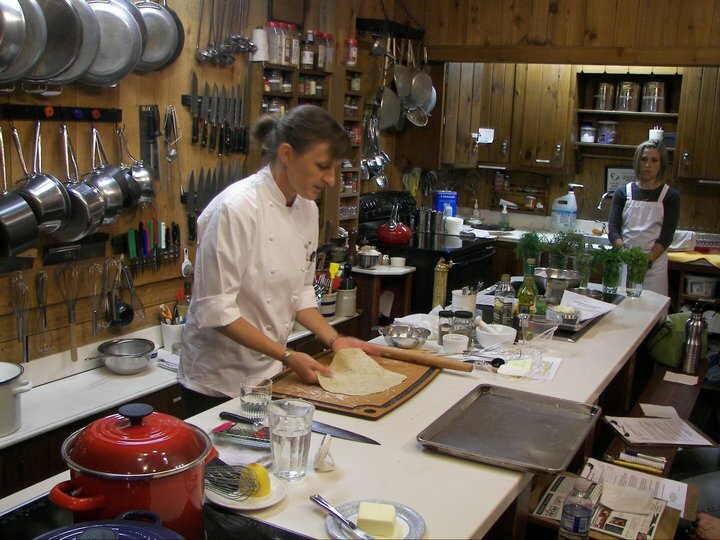 She is one of my all-time favorite teachers and recipe writers, and I highly recommend taking a class with her if you can. And I am looking forward to her next book, All About Roasting, due out in about a year. Still don't think I can cook, but gosh does your blog make me want to eat! !